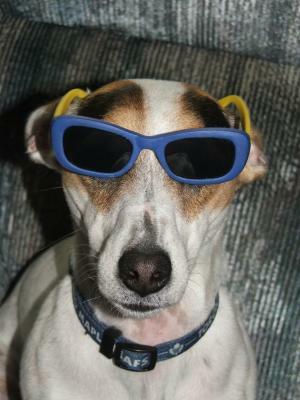 I just couldn't resist trying these sunglasses on my JRT, Ryder! My confession is that I just love to photograph my pooch! I must have taken a dozen pictures of him wearing the sunglasses. His reward for sitting still...? I let him chew on the sunglasses for a bit.